Welcome to The Mohan Group. Our expertise at The Mohan Group lies in being able to connect with the individual business or consumer. Chances are that you’ve never heard of us. Well, we’ve managed to stay pretty well under the proverbial radar for these past 27 years, keeping our nose to the grindstone and producing great advertising for some of the biggest blue-chip companies and brands on the market. 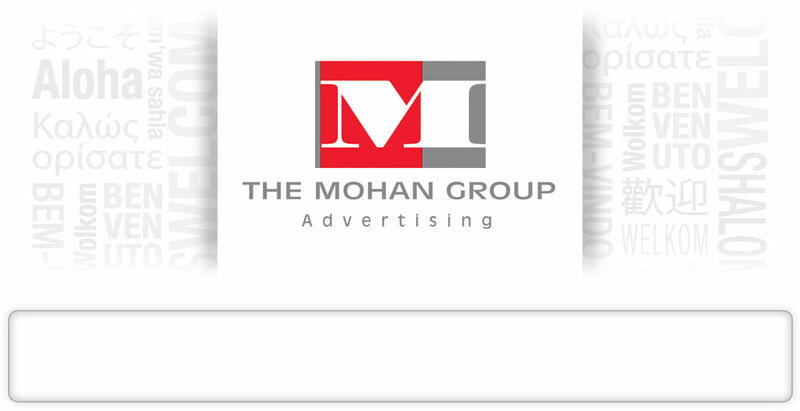 The Mohan Group is a Toronto ad agency whose expertise lies in being able to connect with the individual business or consumer because we design our communications to go beyond the traditional agency responsibility. We have a finely tuned infrastructure that allows us to research, conceptualize and effectively develop creative which delivers the specific message to a specific individual… variably, efficiently and effectively. Over the years, we’ve conceptualized engaging package designs and advertising campaigns which stand out in a crowded, competitive marketplace. After all, that's what they’re intended to do and our designs have succeeded in capturing attention, sales… and even some awards. And most importantly, we’ve continually produced measurable results for our clients! Talk to us today and discover why so many successful brands use The Mohan Group for their advertising, branding, promotions, point of sale, packaging and digital marketing.